My husband and I have been mulling over changing our frying pans to more efficient ones. I am very pleased to receive the 8″ Green Earth Pan by Ozeri because we had a trial run about the non-stick performance of the pan compared to the previous Teflon pans we have. What I instantly noticed about this frying pan is the textured surface on the shape of hexagons like that of a beehive. The non-stick properties of this ceramic pan is really superb! I fried a sunny-side up eggs without using any oil so I can test it’s non-stick performance and I was impressed. I usually pour a small amount of olive oil on my teflon pan when I fry sunny-side up eggs because even when I don’t use oil, parts of the fried egg still gets stuck on the pan. The Green Earth Pan by Ozeri is very effective on that part. The food cooked a bit faster compared to when I use our other pans. 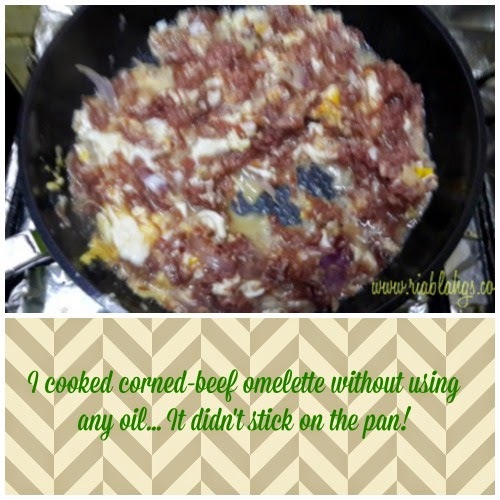 I cooked corned beef in the morning and noticed that I finished in less than 5 minutes and it is a bit longer than that using the same sized ordinary frying pan and cooking the same amount of corned beef too. The pan is not coated with harmful chemicals such as PolyTetraFluoroEthylene (PTFE) which is a known to release very harmful chemical at high temperatures. It also does not contain PerFluoroOctanoic Acid (PFOA) which is known as a pollutant to the environment. 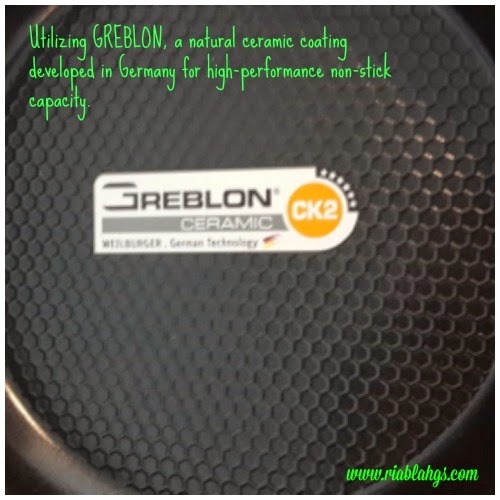 The Green Earth Pan by Ozeri uses Greblon, a coating developed by Weilburger GmbH from Germany which is a ceramic coating derived from nature. The 8″ size of the pan is enough to use for frying smaller food like eggs, bacon, sausages, small serving of stir fry veggies. I like the sturdy silicone handle which is also heat-resistant. This pan can be used on induction ovens. It is very easy to clean as the patterned surface helps prevent food from sticking. It has a free thick felt pan cover so the surface won’t get scratched when accidentally placed on top of another pan. Nothing. 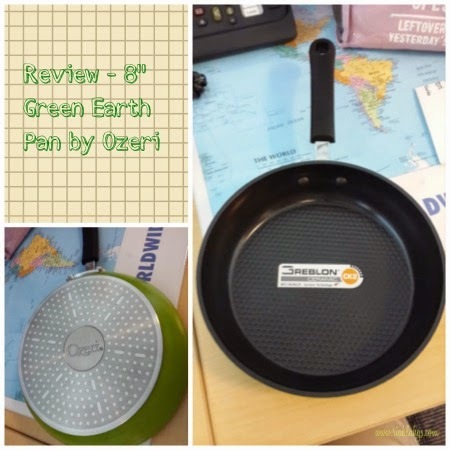 I am very satisfied with the Green Earth Pan by Ozeri’s performance. It did not disappoint me at all. It is packaged in a small cardboard box with cut-out window on the front to show the patterned non-stick surface of the pan and another cut-out window at the back to show the back part of the pan. It also came with a thick green felt so use when you want to stack it on top of another pan without accidentally damaging the surface. I highly recommend this product. I like how it is not heavy and how fast it gets heated and evenly too. I also like that it does not contain all those harmful chemicals which can seep into our food when cooked at high temperature. This is a great product to have and use at home. To know more about Ozeri and the product it carries, please visit www.ozeri.com. 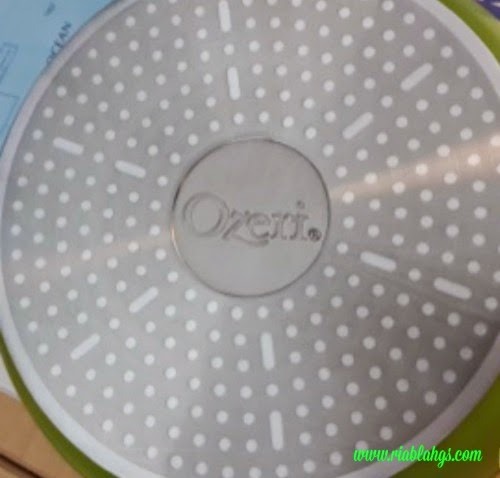 I received this Ozeri pan for free for evaluation purposes. My opinion and findings are 100% mine and may vary from yours. I only review products that I like and will use.